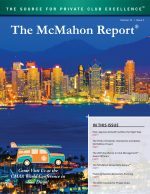 Not all surveys are the same and McMahon Group offers a variety of them. Our most common is a comprehensive membership survey that our clients undertake every three to five years. It typically addresses in-depth strategic and long-range planning issues while testing member satisfaction with all aspects of a club’s existing facilities, operations and services.Another is a facility opinion survey. This is used specifically to test member opinions and acceptance of a proposed capital program before it’s put to a membership vote. The results provide the club’s board and planning committee with valuable input, allowing for tweaks to be made (if need be) to the proposed capital program before a vote. Thus, it significantly increases the chance of a successful vote. A more targeted tool is the Mini-Survey™. It normally hones in on one or two club areas or departments (i.e., golf, dining, etc.) to test member satisfaction. For example, perhaps a club’s leadership has been receiving feedback from members on specific areas or departments and they need to quantify member satisfaction to determine if the feedback is representative of the entire membership or just the opinions of a vocal minority. A number of recently conducted Mini-Surveys™ have been for clubs that conducted comprehensive membership surveys a year or two ago that identified specific areas in need of improvement. After the clubs took action to address said areas, the Mini-Survey™ provided them an ideal tool to determine if members felt the “fixes” were effective. We include our exclusive Value Boundary™ Chart in each Mini-Survey™. We include our exclusive Value Boundary™ Chart in each Mini-Survey™. The chart visually compares importance and satisfaction to show needs and accomplishments. 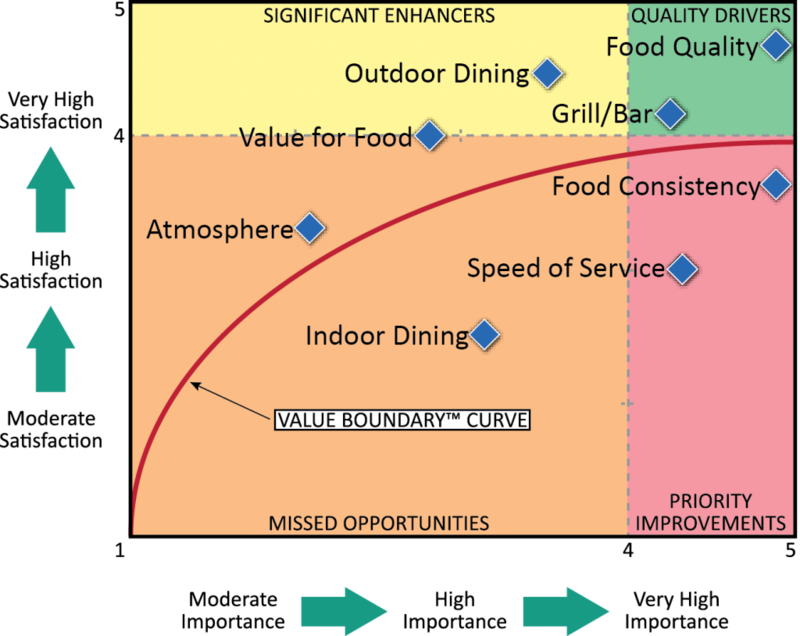 The Value Boundary™ Chart on the left shows different aspects of a club’s dining program. The goal is for all aspects to be above the Value Boundary™ Curve, especially those to the far right which are most important. Aspects below the Value Boundary™ Curve need improvement in satisfaction. With this and the Mini-Survey™, the club knows what it is doing right and where “fixes” need to occur. As a result, the club’s dining program and its membership’s overall satisfaction can be improved! Because the Mini-Survey™ targets specific areas of member interest, it is a much shorter survey in length compared to a comprehensive membership survey. It also requires less time for members to complete and has a higher response rate. The Mini-Survey™ is completed in a month, compared to 60 to 90 days for a comprehensive survey, and costs much less than one too. Hailing from the Los Angeles area, Tom left sunny Southern California at the ripe old age of 17 to attend the United States Military Academy at West Point. After graduating with a degree in Civil Engineering, he spent 11 years on active duty in the Army and then another 11 years in the Army Reserves, eventually retiring at the rank of Lieutenant Colonel. Along the way, Tom earned a Master’s Degree in Hotel & Restaurant Management from Florida International University in Miami. During his 22-years in the Army, he had a chance to see the world, with assignments in South Korea, Germany, the Pentagon, Virginia, Indiana, Florida, Alabama, Maryland and Washington state. Tom has been with the McMahon Group since 1990, serving as head of the survey and market research division. During that time, he has worked with over 1,500 private clubs on a wide variety of survey and research projects, achieving the rank of “Survey Guru” at McMahon. Over the years, Tom has been a jack of many sports – golf, tennis, racquetball, squash, water skiing, snow skiing, running – but a master of none. His current pastime passions are gardening, cycling and nature photography – often combining the latter two on rides at a lake near his home in suburban St. Louis. Tom and his wife Marlene have two children in their 20’s. Katy is an artist working at an animation studio in Portland, Oregon, and Marcus is studying Mechanical Engineering at Cal Poly San Luis Obispo.